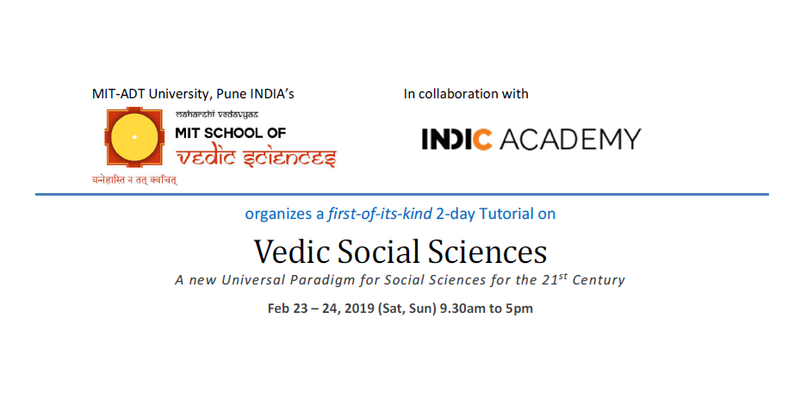 School of Vedic Sciences, MIT-ADT University, Pune in collaboration with Indic Academy announces a first of its kind two day tutorial on Vedic Social Sciences on Feb 23 – 24, 2019 (Sat, Sun) 9.30am to 5pm. Social science is the systematic study of human society and social relationships to predict social behavior. A comprehensive understanding of human psychological makeup and motives is crucial to deconstruct social behavior and address the multiplying social distress. This tutorial highlights the social and cultural biases inherent in mainstream social sciences and humanities today. It presents the Vedic approach and how it can transform the discipline in a fundamental way. The motivation behind this programme is – while the scientific community tries hard to keep the subjective bias out of its process, it is now well recognized that the social and cultural background of the researcher can greatly influence the methodology adopted in pursuing knowledge and the conclusions drawn. Their influence is more pronounced in mainstream social sciences and humanities, which have largely evolved under European social conditions. The academic world has long recognized this influence and the importance of studying diverse indigenous knowledge systems in expanding human wisdom. Why Vedic Perspective for Social Sciences? Dr. Nagaraj Paturi is a well-respected scholar in Vedic aesthetics, linguistic and cultural anthropology specializing in folk-classical (Vedic) interface, as well as in Vedic civilizational thought. He teaches courses in Qualitative Research, Ethnography, Semiotics, Cognitive Cultural Studies to students of Design, Communication, Classical Dance, Business Management etc. employing Vedic Science approaches where applicable. Introduction to Vedic Sociology, Vedic Anthropology, Vedic Political Science, Vedic Public Administration and Vedic ‘History’ – their global relevance for handling cultural diversity and conflicts. It will also spur new understanding of the pre-modern Sanskrit literature and pre-modern Indian society for the larger good of humanity. Where Hyderabad (Tentative). Other options: Bangalore / Pune. This conference is organized by Dr. Sai Susarla: Dean, School of Vedic Sciences, MIT-ADT University, Pune INDIA. M: +91-9902039123. Previous PostWhat is a Lingam?